Whether it’s a cool café come wine bar, an underground speakeasy, or a luxury hotel with Prosecco on tap, Edinburgh is full of incredible places to enjoy a drink or two. With an offering to challenge cities such as London and Paris, you don’t need to go far to come across some of the best mixologists in the business. I’ve pulled together a list of top places worthy of a tipple to two. You’ll need more than one evening to explore all these fabulous watering holes, so pack your bags, don your Prosecco shoes and come for the weekend. Harvey Nichols is the go-to place for a spot of luxury shopping. Their Fourth Floor, with panoramic views overlooking St Andrews Square and the city beyond, is just as exciting as their fashion offering. You can head for the Cocktail Bar, but I recommend you make a beeline for one of the tables in the Brassiere. If it’s warm enough you can commandeer a table on the balcony and choose from a fabulous selection of cocktails, spirits, wines and champagnes – a different champagne house features each month. I can recommend the ‘Fourth Floor Smash’, made up of cointreau, crème de fraise du bois, fresh lemon juice, sugar syrup, fresh strawberries, and their own Harvey Nichols Brut Champagne. From the skyline to the basement, Panda & Sons is a hidden gem. An old school barbershop entrance on Queen Street takes you downstairs to a cool and quirky, speakeasy cocktail bar. The stylish bartenders embody the essence of this bar. Friendly and incredibly knowledgeable, they can create pretty much anything your heart desires. The ‘classic’ cocktails on their menu won’t feature any combinations you’ve heard of before… my advice? Take their lead and try something new, you won’t be disappointed. ‘Wine. Cheese. Company.’ The team at Smith & Gertrude know what’s important in life. 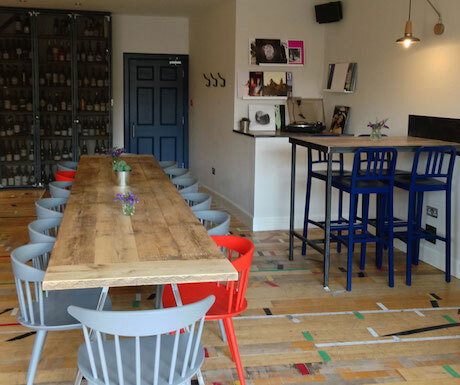 A fairly new addition to Stockbridge’s food and drink scene, you’ll find this relaxed wine bar on Hamilton Place. They offer a fabulous selection of wines, moreish cheeseboards, delicious charcuterie and the odd bit of home baking. The homemade sausage rolls are absolutely divine and compliment an afternoon glass of wine perfectly. You can order wines by the glass, carafe or bottle. If you’re looking for something different, try their sparkling Shiraz. Staying in Stockbridge, The Last Word is a serious contender when it comes to great cocktail bars in Edinburgh. Tucked away down the stairs on St Stephens Street, lots of dark wood, chunky wooden tables and blackboard walls make for a dark interior, and the roaring fire in the front room is very inviting on a cold winter’s eve. They do an excellent ‘Old Fashioned’ and the bartenders are always keen to swap your go-to spirit for something new. Part of the five star G&V Hotel, formerly Hotel Missoni, Bar G&V has certainly not lost its style since changing hands. They describe themselves as ‘where tradition meets modern’ – extremely fitting for their prime location in the heart of Edinburgh’s Old Town, just a stone’s away throw from the famous Royal Mile. An impressive cocktail list is accompanied by bar food made for sharing. However the real draw is the Prosecco on tap – they know the way to a girl’s heart. This has to one of the grandest places in Edinburgh to enjoy a glass of fizz. The Grill Room is a thing of beauty; high domed ceilings and a full circular bar in the middle of the room surrounded by columns and beautifully detailed mosaic floors. Known for it’s fabulous festive decorations, The Dome comes into its own during the Winter months. Throughout the rest of the year, the floral displays are almost as impressive as the building itself. The only thing? Be prepared to stand, tables are almost always full, but rest assured a spot at the bar is just as good. There are two Bon Vivant bars in Edinburgh, but my heart belongs to one on Thistle Street. It is a cute little place next door to it’s own Bottle Shop – you can imagine the wine list is good. Always buzzing after work hours, Bon Vivant aims (and succeeds) in having something for everyone – you will be as comfortable here enjoying a low-key, local craft beer as you will be popping a bottle of champagne for a special celebration. My top tip? Get a few ‘bites’ to keep you going, their Scottish take on tapas is delicious. The streets of Edinburgh’s Old Town are a maze of alleyways, twists and turns, and if you wander for long enough, you’ll stumble upon The Devil’s Advocate. Part of the same family as Bon Vivant, this modern, Scottish bar is a welcome addition to the group. Tucked away on Advocate’s Close, it’s all exposed pipes and chunky wooden interiors. The impressive floor-to-ceiling bar is stocked with every spirit imaginable, and the downstairs bar creates a great buzz for the restaurant mezzanine level above. It also has a small outside decking area, creating a little suntrap in the Summer months, if only for a few hours each day. Wander slightly South of the city centre and you’ll come across The Blackbird. Winners of the Scottish Style Awards over the years, you can expect a trendy offering. Fun and slightly quirky interiors, lots of exposed brick (they go big on funky wall décor) you can get everything from local spirits and craft beers to all the house staples. The Blackbird also has one of Edinburgh’s few beer gardens, and it’s not tiny either. I’ll be taking up my spot as soon as the weather warms up. Last, but by no means least, The Printing Press, the latest bar to open on Edinburgh’s busy George Street. Part of The George Hotel, the bar and restaurant area has undergone a complete refurbishment. Attention to detail has maintained all the grandeur of this fabulous Georgian listed building, whilst bringing a contemporary feel through elegant glassware and a modern colour scheme. This is the place to head for Martini lovers – you can work your way through all 7 on the cocktail list. Great article. For some reason, people never seem to associate Edinburgh with quality, upmarket bars. This list may change their minds! I’ve been to the fourth floor at Harvey Nichols, Edinburgh & the Dome..both fabulous. Shall have to visit some of the others when I’m next in Edinburgh visiting family. This looks like an amazing list! A lot of these remind me of swanky places in San Francisco. Bookmarking this for my summer travel excursion :)! Very interesting reading – we live here and will need to try some of these! St Stephen’s street and Thistle St both have an eclectic mix of bars and restaurants. Thanks Hester – I couldn’t agree more, I could spend hours wandering both those streets! Edinburgh is a lovely place, must go back again sometime soon. Do I need to write a short novel here or what? I’ve always turned my nose up at store eateries but this one at Harvey Nichols pushes the boat out. Hats off ! I was sipping a glass of prosecco in The Dome a couple of weeks ago, it never disappoints! Looking forward to heading back in summer when the terrace is open! Get along to the Blackbird, great food, great cocktails, all served by great bar staff. Weather is picking up, so beer garden will be brilliant over the summer!!! This is a really interesting list – we’ll definitely try a couple of those places. Can’t believe you didn’t include the Cafe Royal though – it’s a must see!